As of today, I’m on a podcast! Check out “Guide to the Cosmos,” a podcast hosted by Dr. Robert Piccioni, at www.guidetothecosmos.com. It was actually Christmas Eve Day when we recorded this interview over the phone, and it’s a two-parter. The first part, in today’s episode, is about water on the moon, and I talk all about the recent discoveries by Chandrayaan-1 and LCROSS. The second part is about the origin of the moon, and that part of the interview will air in February. The audio part of the podcast is actually on a different site, called WebTalkRadio. You can go to their main site, www.webtalkradio.net, and then look for “Guide to the Cosmos” under the “Show podcasts” tab. But I’ll make it easy for you and give you a direct link. Dr. Piccioni also puts some images up on his own website to go with the podcast, which you can look at here as you listen to the interview. When I recorded the interview I did not know which images he was going to have up on his website, so I wasn’t able to refer to them directly. Let me fill in that gap here. 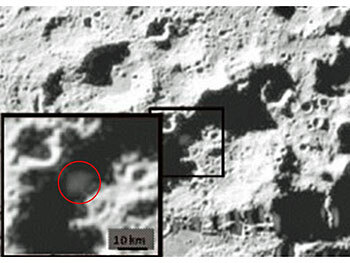 Image #1 shows the impact plume from LCROSS’s crash into the Cabeus crater. This cloud of debris was not visible from Earth. The photo was taken from the “shepherding satellite” that passed directly overhead and crashed into the moon 4 minutes later. The spectrometers on the shepherding satellite analyzed both the absorbed and emitted light from this cloud to look for traces of water and other compounds. Image #2 is just a pretty picture of the full moon, nothing else. The LCROSS impact happened way down at the bottom of that picture, in the bumpy area around the south pole. 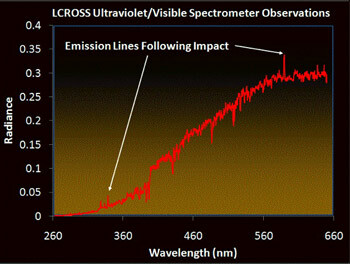 Image #3 is a “wiggly line” from the ultraviolet and visible spectrometer. You can also see two shorter peaks on the left that have not been identified yet. At the AGU meeting in December, Tony said they think that one of them could be gold! Yes, gold on the moon. You read about it here first. Back in the days before Apollo went to the moon, there was a slightly kooky scientist named Tommy Gold who said that the moon was covered by a layer of dust so deep that any spacecraft that landed on the moon would just sink into it and never be seen again. Fortunately, this didn’t turn out to be the case, but for a while NASA had to take the possibility seriously, and his hypothetical surface layer became known as “Gold dust.” But now lunar gold dust may take on a whole new meaning! I did not report on this earlier (“LCROSS Strikes Gold!”) because they really don’t know what the peaks are yet, and so Tony’s comment was at least partly meant in jest. If they ever get more serious about it, I’ll be sure to let you know. Last month I wrote an article for New Scientist online about the moon sessions at the AGU meeting, called “Are We Looking in the Wrong Places for Water on the Moon?” This was a very ticklish article to write, but I was happy with it in the end. Basically, the story is that one of the instruments on the Lunar Reconnaissance Orbiter (LRO) has been seeing lots of indications of water in places where it isn’t supposed to be. LCROSS went to a permanently shadowed crater because that is where theory says that lunar water, if it exists, should concentrate. It went to Cabeus, in particular, because that is where the Lunar Exploration Neutron Detector (LEND) on LRO saw the highest concentrations of water. But what’s interesting, and controversial, is that LEND has seen no correlation so far between permanent shadowing and hydrogen deposits! There are other regions with just as much water as Cabeus that aren’t in shadow. What made the article ticklish to write is that there are some people who frankly don’t believe the LEND data yet. I tried to hint at this without pouring oil onto the fire. But there are three groups–one in Russia, two in the U.S.–who are working on the LEND data and they all are saying pretty much the same thing. You can’t just ignore this fact and pretend it isn’t there, while at the same time singing the praises of LCROSS and the LRO camera and the other experiments on LRO. That’s why I felt it was important to write this article, even if the jury is still out on what the results mean. In a blog I think I can be more adventurous than I can in print, so I’ll hazard a guess as to what it might mean. The LCROSS results are hinting that there is way more water than you can produce by bombarding the moon’s surface with the solar wind–some of the water has to be from meteoroids or comets. LEND can see beneath the surface, and Igor Mitrofanov, the principal investigator for LEND, says that he thinks they are seeing deposits of hydrogen that lie beneath the surface, covered by a layer of dry soil. Putting two and two together, I think that the water is delivered by meteoroids/comets, and is then buried by some process we don’t understand yet (or maybe it’s just in a sufficiently thick layer to begin with?). Once it’s buried, it doesn’t need a permanently shadowed crater to keep it from evaporating. Sure, it might be associated with a permanently shadowed crater, but really any crater will do. Or maybe even something that isn’t a crater! One of the most puzzling things about the LEND data was that one of the hydrogen deposits seemed to be on one side of a mountain range. But maybe that makes sense, if the mountain range was created by the meteoroid/comet impact. Well, this is just my feeble amateur speculation. The specialists will, of course, hash it out and either come up with an explanation, or agree to disagree. One thing that’s pretty certain is that there is a lot we don’t know yet. This entry was posted	on Monday, January 11th, 2010 at 3:37 pm and is filed under Media, Meetings, Missions, NASA, Science, websites. You can follow any responses to this entry through the RSS 2.0 feed. You can leave a response, or trackback from your own site. I’m surprised that you propagate that myth about Thomas Gold, though. He said to his dying day that the moon was covered in a very thick layer of fine dust. But it’s compacted under its own weight, just like similar places on Earth. (Denver, for example) He was misquoted in the 1960′s and the myth spread though newspapers. The Apollo missions actually proved him right, not wrong – the Moon IS covered in a fine layer of dust. But NASA continued to ridicule him.